It is said every year, the commercialization of Christmas is terrible. Personally, I do not buy into that philosophy that somehow the giving of gifts is evil and refraining from celebrating Christmas is not much different from how Scrooge celebrated Christmas. For many, Christmas is representative of the greed that consumed modern day America. Somehow to participate in Christmas is to be materialistic, causing you to miss the real reason for Christmas- the birth of Christ. For Scrooge, money was something to be collected and to hoard - not to be spent. Scrooge failed to spend money on himself, much less his own business. Scrooge does not spend money on his office, his home or his workers. When Bob Cratchit wanted to add an extra piece of coal to keep his office warm, Scrooge vetoed the idea. Charles Dickens writes about Scrooge’s home, “It was a very low fire indeed; nothing on such a bitter night. He was obliged to sit close to it, and brood over it, before he could extract the least sensation of warmth from such a handful of fuel. The fireplace was an old one, built by some Dutch merchant long ago, and paved all round with quaint Dutch tiles, designed to illustrate the Scriptures.” Scrooge lived in an antiquated home and he did not even spend money to keep his own home warm. He denied himself the joy of his own income for money was merely a scorecard to show his success and Scrooge's selfishness applied even to himself. It is said that charity begins at home and man who can’t share with himself is not very likely to share with others. Contrast Scrooge with his nephew Fred, who spends on Christmas and enjoys the gaiety of the holidays. Even the Crachits celebrate Christmas with their meager savings for money is no object in rejoicing the birth of Christ. 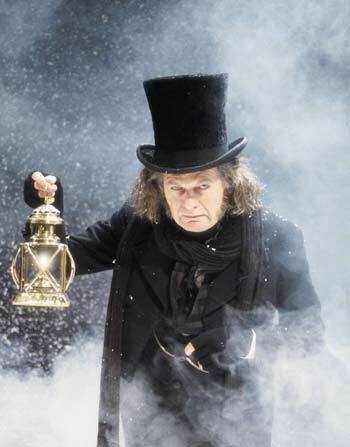 For Scrooge, he lived a business life that was more amoral than moral or immoral. To him, business was business but as Marley reminds him, “Mankind was our business.” A businessman must serve his customer, or he will not be successful. Christmas represents the universal message of peace and forgiveness, and you do not need to be a believer in Christianity to buy into these virtues. “A Christmas Carol” is a story of giving and receiving, of redemption and reclamation. The spirits seek to reclaim Scrooge's immortal soul and reform the previously selfish man, whose only thoughts never extended beyond his nose. It is at Christmas that we give of ourselves to others. It is the season that we give each other gifts, to show our love for significant others, for our friends, for our spouses and children. For Christians, Jesus’ birth was a gift to mankind and this a gift we can never pay back. Three kings arrive from the East with their own gifts of gold, frankincense and myrrh for the new King. Christmas is the symbolic season of unconditional love and giving. When lovers or friends begin to keep score, the relation is soon over. Giving should be unconditional if you love someone and you should be as appreciative when receiving a gift from others. Giving is a form of showing love and how much you value your relationship with others. Somehow, the world would be poorer, and not just materially, without Christmas. His change is what Christianity represents. He began to invest in his business, both in the office by allowing Cratchit to use more coal to heat the place and by raising Cratchit’s salary. Christianity is about second chances, third chances, fourth chances and unlimited chances. It is about giving and receiving. Christmas represents those qualities as we seek love and forgiveness from those who are closest to us. It is the spirit of the season that warms us. For a Christian, we can never repay the debt owed to God, who sent his only son to break the power of sin. So, sometimes we can’t repay the debt that others have given to us in the past. What we can do is to share our bounty with others, beginning with those who are the closest. Charity begins at home. Christmas does, indeed, represent the spirit of Christianity.